Once you've found your Medication, buy it online, FAX your paperwork, or call Toll Free: 1-888-487-3440. We require an original Rx prior to dispensing your order. Average delivery time is 2 - 3 weeks. Global Care Rx contracts with licensed pharmacies in Canada and around the world, as well as fulfillment centers, in order to provide you with the lowest possible prices for your medications. You can buy medications at lower prices from international pharmacies and fulfillment centers. Just like your local pharmacy, you can speak to a pharmacist at any time and you will receive your medication at your door step within 2 to 3 weeks. Our international prescription service contracts with licensed pharmacies and fulfillment centers, and you can save up to 90% when purchasing medications from Global Care Rx. Just because you don't have insurance doesn't mean that you have to pay ridiculously high prices for your medications! Stop paying unfairly high prices for your medication and order practically the same medication from Global Care Rx's contracted pharmacies. We are committed to saving you money on your medications. If you do not have insurance, do not worry. 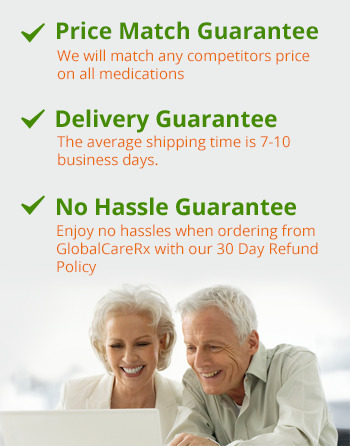 You will always receive the lowest price when ordering your medications from Global Care Rx, guaranteed. Just like your neighborhood pharmacy, Global Care Rx discount prescription service will only refer orders that accompany a valid prescription for all products which require a prescription. You can send your prescriptions to us by fax, email, or mail. We will be happy to call your doctor for your prescriptions in the event that you do not have one available to send to us. Please provide one of our customer service representatives with your doctor's contact information and we will be happy to call them for your prescriptions. All orders are backed with a 100% Price Match Guarantee. If you find the same product at a lower price, let us know and we will match it! Buy all of your medicines from Global Rx Care online prescription service with confidence.